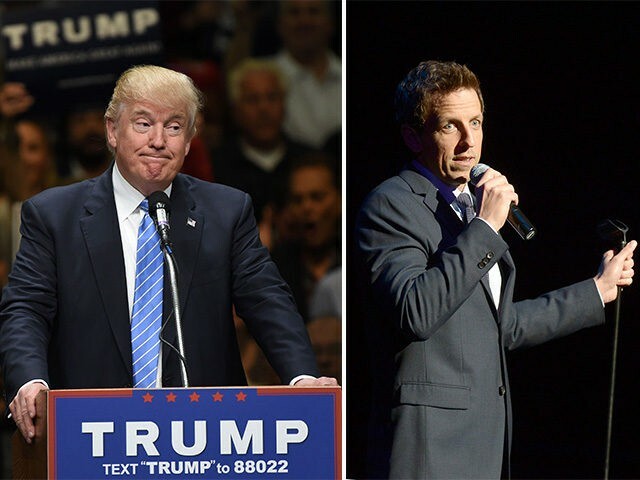 During Tuesday night’s episode of Late Night, Meyers said that Trump would no longer be allowed on his NBC program as long as the Washington Post was unable to cover the candidate’s campaign events. The Trump campaign revoked the Post‘s press credentials after the newspaper suggested in an article that he had tied President Obama to Orlando terrorist Omar Mateen during a national security-focused speech on Monday. Trump does not shy away from returning fire when celebrities or media personalities criticize or threaten him. In April, in response to statements from celebrities including Whoopi Goldberg and Lena Dunham that they would leave the country if Trump were elected, the candidate told Fox and Friends in an interview that he would doing the country “a great service” if “B-actor” Dunham and her associates followed through on the threat. “As far as George Clooney is concerned, let’s put it this way — he’s no Cary Grant,” the candidate said then.